*Jabber Box is compatible with 8816 different models of Android 4.0 and up mobile devices. Jabber Box enables users to enter text for rendering into audible speech using the Google Text to Speech Engine. Messages can be played immediately or scheduled to be played back at a specific time. Messages can be saved to groups or Categories of similar messages. Users can schedule a group of messages to be played later in order or randomly. A pause of 1 minute or more between messages can be entered. I have included a Category in the application called “Pocket Prisoner” so you can experiment with how group jabbers work. I have created groups like “The Nag”, “Fake Messages”, “Fake Phone Calls and “Fake Notifications” among others. Be creative and see what you can come up with and share with me if you like! 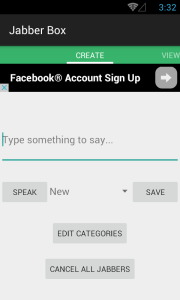 Enter text up to a limit of 4000 characters for text to speech playback. Use the Speak button to immediately listen to the playback. The drop down selection box lists the default Categories any you have created by pressing the Edit Categories button. When pressing the save button, the new message will be saved to the Category appearing in the box. Tap on the Categories box to select another category as needed. Select from the Category box to see all saved messages in that category. Tap a message item in the list and listen to play back. Long press a message item. Three buttons will appear below the Category selection box to schedule play for a later time, edit the message or delete the message. 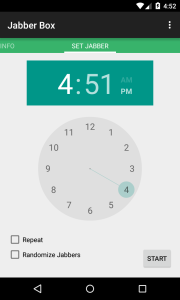 Newer versions of Android will display a time picker widget that looks like the one pictured here. Earlier versions will display a text-based picker. Select a specific time to begin the jabber session to begin. Tap the Repeat box to set a pause (in minutes) between each message. Tap the Randomize Jabbers box to randomize the playback for all messages in the category. leaving the box unchecked will result in play back in the order they are listed. You may want to look at some of the messages I have created for the Pocket Prisoner category to see how I have used punctuation to insert some slight delays in the speed of playback. Most Android devices have changeable settings where you can set the speed and tone of playback and even download voices from other countries and languages! Lots of fun, and even practical things to experiment with using Jabber Box. I have a little story of how the whole thing got started. So experiment, have fun with it, share it with friends and help support my app projects by clicking on ads that interest you. Use the Contact page if you have any questions or comments or sign in and comment below. Thanks for your support! *Jabber Box is compatible with 8816 different models of Android mobile devices running on Android 4.0 up to 5.1 according to testing and certification. Let me know if you experience any problems with the application on your device. Please provide maker and model along with the Android OS version your device is running. Thanks!